TO say we are going to be inundated with football coverage over the next month would be something of an understatement as the Euros take over our screens. 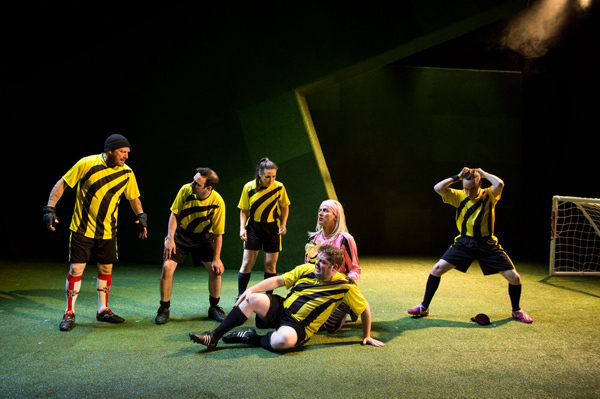 Whilst the arts usually like to offer alternative programming, the Lyric Theatre is embracing football fever in all its glory with Gary Mitchell’s latest work Smiley. Directed by Conall Morrison the production tells the tale of small-time wheeler-dealer Smiley played by Here Comes the Night’s Michael Condron. The comedy crime caper centres on a group of Belfast misfits who decide to form a five-a-side football team and enter a lucrative tournament. However, this is just a front as it becomes clear that Smiley and his band of cohorts are planning to rob the organisers who just happened to be ex-loyalist paramilitaries. Smiley’s crack team brings together his disgruntled ex-wife, naïve son Tommy, a safe-cracking Elvis impersonator and his drag queen partner – who hasn’t kicked a ball in his/her life – and his ex-girlfriend’s daughter Charlie, the best (if not the only) player in the team. The set changes during the play are as fast paced as the banter between characters. A dingy, dimly-lit back room turns into a bar with Elvis doing his best Hound Dog, then it morphs into a locker room and an astro turf pitch. The performances are universally good. And if the characters are a touch clichéd, Mitchell’s dialogue more than makes up for that. Conall Morrison’s direction has the snap that the dialogue deserves. The packed house was literally laughing in the aisles at times and on their feet at the end.